Hard boil the eggs; cool and peel. Peel and slice one carrot into thin rounds; julienne (thinly slice into matchsticks) another carrot; the remaining carrots may be cut into sticks. Set all aside. Cut a small portion of the top of each egg, about 1/8 of an inch. Place a skewer down the center of each of four eggs with the cut portion facing up. Place another egg on top of each of the four already skewered, but with the cut portion facing down. Place pretzels into the side of each egg for its arms. 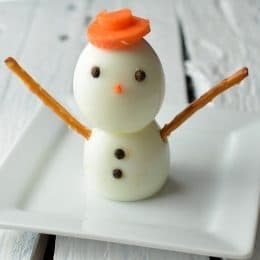 Using whole peppercorns, give the snowman some eyes and buttons. Top off with a carrot round for a hat (you can use a small amount of mayo or ranch dressing to keep the hat in place if desired) and poke a matchstick carrot in for a nose. Serve with extra carrot sticks.